Seven Ways to Keep Memory and Focus Sharp Clear the Clutter – Get Organized – Improve Physical and Mental Health! Do You Feel as Though The Longer and Harder You Work, the Less You Get Done? If this describes you, it’s time to consider effective delegation. Let’s face it, leaders make it to the top because they get things done. As a result, they often find it difficult to delegate to their team and support staff, those tasks that would make the leader more productive when removed from their schedule. Although delegation is a critical leadership skill, it “remains one of the most under used and under developed management capacities.” Even when delegation is recognized as a necessary skill, few corporations provide adequate training or practice. Who do you trust? Select the person who has a good track record or one who will develop competence under supervision. When are things due? Is there enough time? Schedule follow-ups and benchmarks. Are standards clear, measurable, and reasonable? Where are the resources and settings in which the project or tasks are due? Why is it necessary? No one wants to be saddled with busywork that contributes little to a project. Perhaps more mundane or tedious tasks need to be distributed so that you and others are not overwhelmed. Describe ways in which recognition and other positive consequences are available? How will the task or project be implemented? What are some barriers to delegation? Think its too stressful to delegate? Like any new skill, learning to delegate can be challenging, a bit stressful, and require some practice. However, developing skills to delegate with finesse tends to reduce stress and overload while enhancing productivity. For the leader, improved delegation helps focus on issues only he or she can do and allows one to accomplish more, with better quality, and in less time. For staff, effective delegation sets the stage for greater team involvement, provides opportunities for growth, and increases self-confidence. Start small. Get out of the “all or nothing” framework, especially if you are a newbie. Practice your delegation skills on smaller, rather than larger projects. Make a plan and take the time to discuss it. Invite participation. Ask about others’ interests, skills, or areas of potential growth. Align the tasks you delegate with team members who demonstrate competence and experience. Ask for feedback and provide opportunities to interact and adapt when necessary. Consider external training programs if you want to upgrade yours or others’ skills. Think about your strengths and special aspects of your position. For example, many leaders lack “quiet, think times” during which they plan, prioritize, and strategize. These are the tasks that are critical to a leader. On the other hand, there may be technical or mundane tasks that others can and should do. In some cases, you may have a team member who wants to increase skill area. One option is to pair them with an already accomplished person, who can act as a model. Remember, when delegating, ensure that staff knows how to deal with obstacles and seek assistance. If you are feeling overworked and unproductive, it’s time to consider delegation. Soon you’ll see that, yes you can “get it done,” but you’ll have the relief in knowing you don’t have to be the one who does it all! Want to improve your delegation skills? 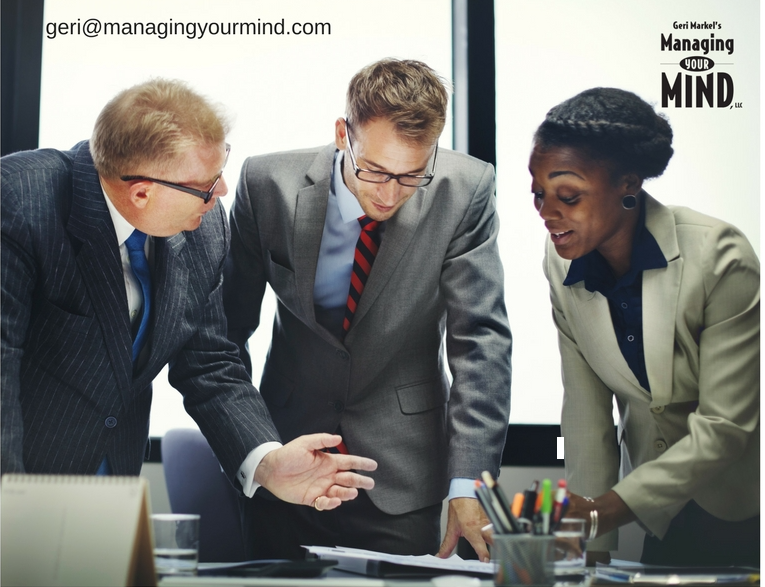 Contact geri@managingyourmind.com for a free consultation.